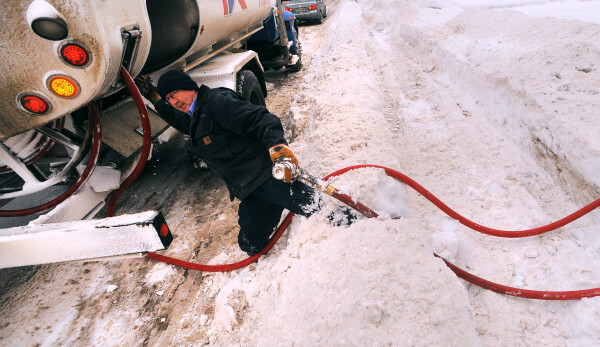 Greg Hamilton, a delivery driver with Dead River Co., struggles through a waist-high snowbank after filling the oil tank at a Brewer home in this December 2013 file photo. PORTLAND, Maine — Gasoline and No. 2 heating fuel oil are 30 cents more expensive per gallon than one year ago in a shift that will hit household budgets this year. The rise comes as crude oil prices have risen from historic lows that, in turn, drove gas to hit the lowest prices since 2004. Heating oil followed suit, and an unseasonably warm winter reduced the drain that fuel costs put on Maine wallets. Those doubly favorable conditions teed up expectations this year that Mainers will shell out more for gas and heat, as about three in five households use No. 2 heating oil. The prices of other heating fuels are forecast to rise, too. The Governor’s Energy Office on Dec. 27, 2016, reported heating oil, kerosene and propane all hit higher unit prices than last winter and federal forecasts project the trend will continue. The U.S. Energy Information Administration on Tuesday updated its estimates of winter fuel costs, projecting that households would spend $350 more this winter on heating fuel than during the last heating season, an increase of 36 percent. The projection, updated from an October estimate, anticipates that crude oil price escalation and more typical winter temperatures will drive up costs. The forecast projects the average household will spend $1,352 on No. 2 heating oil this year, up from an average of $992 last year. Most of the homes using that fuel are in the Northeast. No. 2 heating oil’s share of Maine’s home heating market has declined in recent years, but it remains a prominent feature in just about every county, heating the highest share of homes in Kennebec County. Across the Northeast, the agency expects the average home heated with natural gas to spend $156 more, to $847, as the average spending on propane jumps by $375, to $2,020, for the heating season. Some of the same global forces driving up the price of crude oil will influence how much Maine drivers spend this year on gasoline, according to federal and private-sector forecasts. The price tracking site GasBuddy forecast the annual average pump price will land 36 cents higher compared with last year, at $2.49 per gallon. The Energy Information Administration projects the price won’t jump quite that high, landing about 27 cents higher, at $2.38 per gallon for the year. It projects New England prices will follow the national trend.